Louis Feinberg was born on 5 October 1902, in Philadelphia, Pennsylvania USA, of part Russian-Jewish descent (father). 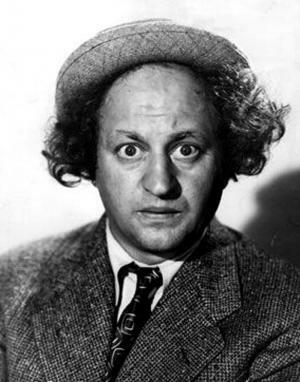 Larry was an actor, comedian, boxer, and violinist, but best known professionally as Larry Fine, a part of the comedy act, The Three Stooges. All of his efforts have helped put his net worth to where it was prior to his passing in 1975. How rich was Larry Fine? As of late-2016, sources estimate a net worth that was at $10 million, mostly earned through success with The Three Stooges, but he had a very extensive acting career, appearing in films, television shows, and stage productions. All of these achievements ensured the position of his wealth. When Larry was a child, he mistook acid as a beverage and nearly drank it – his father would push the acid out of the way leading it to burn Larry’s forearm; later on, he would be given violin lessons to help strengthen the muscles that were damaged. He would become very skilled at the instrument, and his parents had plans to send him to a conservatory. However, World War I happened and their plans did not continue. During his teens, Larry would then take boxing lessons to continue to strengthen his arms. He won one professional fight and then retired after protests from his father. Larry started to perform in vaudeville as a violinist. Later on, he would meet Shemp Howard and Ted Healy, then getting an invitation to become part of the Stooges. He appeared in “A Night in Spain” and later joined the other future stooges, along with Shemp and Moe Howard would then group together as a trio, touring around Europe. They appeared in various Venice shows before getting a film opportunity in “Soup to Nuts”. Eventually after a few changes and disputes with Shemp replaced by Curly Howard, the three made their debut at Cleveland’s RKO Palace Theatre in 1932. The Three Stooges would become part of several features as well as 206 short films, and were also well known as Larry, Moe and Curly. Fine was known as the voice of reason between the stooges, and his hairstyle also became a trademark. Some of their well-known shorts include “Men in Black” and “Disorder in the Court”. In 1959, the Stooges would become even more popular thanks to television exposure, and Columbia Pictures would release many of their films which helped revitalize their career. In 1965, the trio started the show “The New Three Stooges” which had a mix of animated and live segments. The show had good ratings, even though they were getting old for the slapstick comedy routine. Five years later, Larry would suffer a stroke which paralyzed the left side of his body, and he eventually retired to the Motion Picture Country House, but while there he continued to entertain a lot of the other patients. For his personal life, it is known that Larry married Mabel Honey in 1926; the couple loved to party, and he had a gambling addiction such that his friends mentioned that he had difficulties saving money. Larry and his family was also known to live in hotels mainly due to Mabel’s dislike for housekeeping. Larry’s wife would pass away in 1967 due to a heart attack. In 1975, after suffering additional strokes, Fine also passed away. 1 His trademark autograph was "Sincerely, Larry Fine". 2 Always played the middle stooge with a receding hairline and bushy, unkempt hair. While he was not as dominating as Moe or as distinctive as Curly or his replacements, his relative normality allowed him to play the necessary straight man to the others. 1 [to Ted Healy, who said he world pay $100 for his act but to forget the violin] For $100, I'll forget everything! 1 Renowned for his spending, in an interview with Three Stooges Writer/Director Edward Bernds, he said when Columbia shut down the Shorts Departmenrt, Larry was nearly forced into bankruptcy. 2 The same day the Three Stooges left Ted Healy and MGM, Moe Howard signed a contract for them with Columbia Pictures, and Larry, not aware of this, signed a contract for them with Universal Studios. The matter was eventually taken before a judge who determined Moe's contract was valid because it was signed mere hours before Larry's contract. After that, Larry never tried handling the business aspect of their careers again and instead left all that to Moe. 3 Moe Howard, Larry Fine and Curly Howard were awarded a Star on the Hollywood Walk of Fame at 1560 Vine Street in Hollywood, California. 4 His parents, Joseph Feinberg and Fanny Lieberman, owned a watch repair and jewelry shop at South Street in South Philadelphia. 5 His wife, Mabel Haney, died of a sudden heart attack on May 30, 1967. Larry was on the road and about to take the stage for a live show when he heard the bad news. He immediately flew home to Woodland Hills, California. 6 In his youth, he trained as a boxer and had several bouts as an amateur before his father found out and put a stop to it. However, his boxing training did come in handy for his later career with Ted Healy and then The Three Stooges. 7 His son John died in a car accident on November 17, 1961. He was 24 years old. His daughter Phyllis died of cancer on April 3, 1989. She was 60 years old. 8 Owing to his wife's dislike of housekeeping, the Fines spent years living in hotels until they finally purchased a home in Los Angeles after World War II. One hotel that had been their "home base" for years was the President Hotel in Atlantic City, New Jersey, which has since been demolished. 9 Lived in the hills of Griffith Park. 10 When first approached to work for the Three Stooges, he was performing at the Rainbow Gardens nightclub, under contract to Fred Mann. A few nights after being approached, the police closed the Rainbow Gardens for violating the Prohibition laws, and Fred Mann committed suicide. Now free of his contract, Larry joined the Three Stooges. 11 Offstage, Larry was a social butterfly. He liked a good time and surrounded himself with friends. He and his wife, Mabel Haney, loved to party, and every Christmas served lavish midnight meals. Some of his friends called him a "yes man", since he was so agreeable, no matter what the circumstances. 12 In 1973, Fine appeared in an infomercial promoting a book, "A Stroke of Luck", presented as his memoir. In fact, Fine later disavowed this book; the later authorized biography, "One Fine Stooge" (2006), goes into considerable detail of how the book's author/publisher took advantage of Fine in its preface. 13 After his stroke, he never performed again. 14 When Joe DeRita was brought into The Three Stooges (as "Curly Joe"), Moe wanted to make him simply an employee. It was Larry who insisted that he be made a full equal partner. Larry reportedly threatened to quit unless Joe was treated fairly. 15 Has a mural painted of him on a building at 3rd and South Streets in South Philadelphia. 16 Father-in-law of Don Lamond, who appeared in several Stooges full-length features and also hosted the local Three Stooges television show in Los Angeles, California in the late 1950s and early 1960s (which helped give The Three Stooges careers a renaissance). 17 Larry's face was so callused on one side from all of the years of being slapped, it was all but numb. 18 After Columbia shut down its shorts department, the Stooges took their act on the road. What they did not know was that they had found a renewed popularity thanks to television. Larry's sister said when the train pulled into some town, there was a mob of people waiting. Larry wondered who the V.I.P. was; they had no idea the crowd of people waiting was for them. 19 Father of actress Phyllis Fine and John Fine. 20 Larry's final concert appearance was at Loara High School in Anaheim, California on March 2, 1974. 21 Following his death, he was interred at Forest Lawn Memorial Park in Glendale, California, in the Freedom Mausoleum, Sanctuary of Liberation. 22 During his 40-year film career, Larry only appeared in one film that did not also feature fellow Stooge Moe Howard. That film is Stage Mother (1933). 23 When Larry joined the Stooges, Ted Healy offered him a salary of $90 a week and an extra $10 if he threw away the violin. 24 As a child, Larry spilled a bottle of a powerful acid, badly burning his left arm. Doctors recommended that he take violin lessons as therapy to strengthen the damaged muscles. At age ten, he played a solo piece, backed by the Howard Lanin Orchestra. His parents even considered sending him to Europe to study music, but they decided against this when World War I began. 25 Original member of The Three Stooges. Musty Musketeers 1954 Short performer: "A Calling We Do Come" / writer: "A Calling We Do Come"